A big nose means good fortune. Someone who is less than 1.7 meters tall (around 5 feet) is a second class citizen with height challenge. There are companies who will help you name your baby. Baby naming is a major job it seems in order to be sure all the signs are right for longevity, prosperity, health, and peace. Peking, the old name for Beijing, is symbolic of the feudal society before Mao. Buses are the major source of transportation in the city and the fares are quite cheap to encourage people to use mass transit. They charge 1 yuan to ride (about twelve cents US). There are two sets of traffic lights—one for vehicles and one for bicycles. I still cannot figure them out as it seems no one pays attention to them. Magg ie mentions that taxes have changed things in China but she doesn’t define how. Perhaps it gives them all a common problem to complain about but I hope that it means that there is tax money being used to improve living conditions. 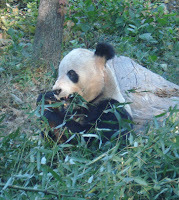 We make a surprise stop at the zoo to see panda bears. 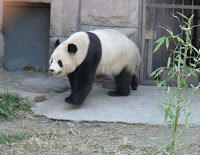 Maggie tells us they are unusually active this morning as we watch them climb over large logs and stumps in their pens. One exhibits the standard behavior as he sits and munches all the greenery in sight. On the zodiac, the dragon is a “bossy” sign. The Dragon Lady (the last empress earned that title) was served by eunuchs. Maggie portrays her as a lady who had milk baths every day and grew long fingernails to point and say “do this or do that.” As we near the Summe r Palace, we are told that everything there refers in some way to longevity, peace, and fortune. May to October, the royal family spent time here. We walk the grounds and enjoy the views of the large lake. Along the way, there are lots of people playing homemade instruments or trying to sell crafts. It is a “shiny” day indeed and the grounds of the palace are displayed beautifully. Up on a hill we can see the “palace” that overlooks the lake but we will not get to walk up to it. I’m not sure if it is because of time or there is no entry. 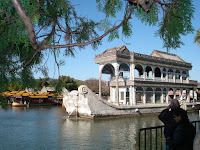 A large cement/stone boat sits in a docking area. It was used by the empress to entertain. I guess she didn’t like a boat that rocked—probably prone to motion sickness. 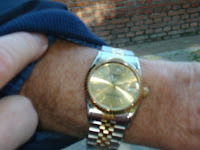 On our way back to the bus, Bob haggles with a man and his wife over the price of a “Rolex.” He gets $12 worth of entertainment after all is said and done and a "nice watch" to brag about.